LEVEL UP WITHOUT BEING TIED DOWN—IN 7.1 SURROUND SOUND. No wires to tie you down. Surround sound so detailed, you can hear your opponents before they see you. With a lag-free wireless connection and powered by Dolby Headphone 7.1 surround sound, G930 keeps your head in the game for up to 10 hours between charges. 1. Some profile settings require Logitech Gaming Software to be enabled and are not supported on Mac, Linux and earlier Windows operating systems. 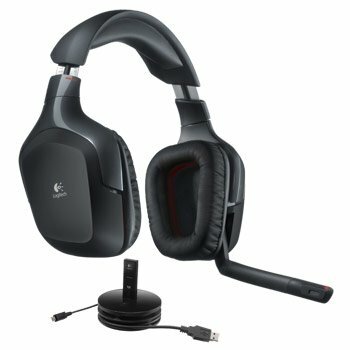 Logitech Gaming Software is available at gaming.logitech.com/support. 2. Actual battery life will vary with use, settings and environmental conditions. Rechargeable batteries have a limited number of charge cycles. Hear them before they see you with an immersive 360-degree sound field. Dolby technology perceptually positions up to seven discrete channels of audio data plus Low Frequency Effects (LFE) in the correct location. Combined with powerful 40mm neodymium drivers, you hear clear, detailed multi-channel sound all around you, just as the developers intended. Gain one-touch control over in-game elements like chat clients, music, voice morphing and more. G-keys are conveniently located on the left ear cup for quick access. Customize them with easy-to-use Logitech Gaming Software1. Just plug the USB adapter into your computer for a powerful, reliable 2.4 GHz connection—without audio delays. Proprietary Logitech technology is up to 38% faster than Bluetooth and automatically hops between frequencies to keep the signal clear and strong. Be heard loud and clear without distracting background noise. The mic picks up only your voice. Rotate the mic boom up and out of the way to auto mute. You have plenty of battery power to get through even the most epic gaming sessions2. And the Included base recharges the headset and powers the wireless adapter with a single USB connection—even while you're playing. The G930 headset works with your PS4 in stereo mode. Experience chat, voice interface and gaming audio in rich, detailed sound. 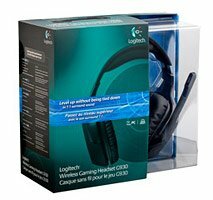 Which Logitech Gaming Headset Is Right For You?